This Polish blueberry cordial, known as likier borowkowy (LEEH-kyerr boh-rrohv-KOH-vih) or nalewka z jeżyn (nah-LEFF-kah zih yeh-ZHIN) is so pretty in the glass but, beware, this benign-looking drink packs a wallop. This easily prepared alcoholic beverage takes several months to mature, so make it well in advance of drinking. It makes a wonderful addition to an edible gifts basket. Combine 2 1/2 pounds washed and stemmed blueberries and 1-quart good-quality vodka in a large, sterilized glass container. Seal and set in a dark, cool place for 1 week. 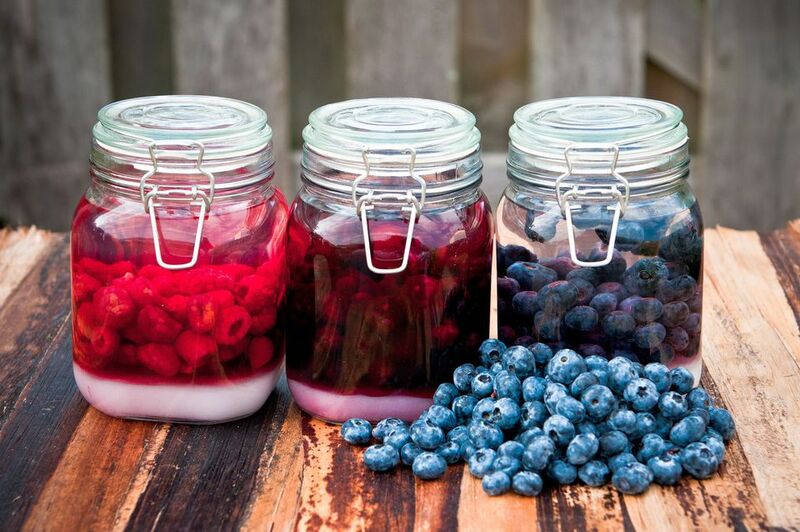 After 1 week, pour through a sieve, reserving blueberries, and transfer blueberry-infused vodka into a clean, sterilized glass container and seal. Add 2 cups sugar to reserved blueberries, mix well and transfer to a separate clean, sterilized glass container and seal. Place both containers in a dark, cool place for 1 month. After 1 month, thoroughly combine blueberry mixture with vodka, strain and pour into a clean, sterilized glass container. Seal and allow to age in a cool, dark place for several months. When serving the cordial, the blueberries can be discarded or served over ice cream or pound cake the same day. An aged liqueur or cordial in Poland is known as nalewka (nah-LEF-kah) and nalewki when plural, and literally translates to "tincture." Typically, they are made fruit, sugar, honey, molasses, herbs, and spices macerated in vodka or rectified spirits known as spirytus rektyfikowany. Other flavors, like coffee, flower, honey, and specific spice nalewki like kardamonka (cardamom), also exist. Nalewki names come from the type of main ingredient used to produce them or the town where they originated. A popular nalewka named after a town is Nalewka Tarninówka, originating from the town of Tarnów near Kraków in Małopolska (Lesser Poland). It's made with sloe berries and is ruby red in color. Many recipes are closely guarded secrets, passed down from generation to generation. The type of spirit used renders them either benign concoctions of about 40 to 45% alcohol or knock-your-socks-off varieties as strong as 75% alcohol. Nalewki is always drunk from little glasses and often served after a meal, at celebratory occasions like weddings and baptisms. It would be an insult to your host if you bolted down a glass like a shot of vodka. A nalewka should be sipped so that its virtues can be appreciated. It should be allowed to linger on the tongue and then swirled around the mouth much like one would do with a fine wine.